It was her second career victory on tour. KAPALUA, Hawaii (AP) â€” Morgan Pressel served as a gracious host but didn’t want to extend Kapalua’s welcome by going into overtime. Pressel birdied the final hole Sunday in the inaugural Kapalua LPGA Classic for her first victory of the season. Kapalua’s tour pro closed with a 3-under 69 to edge Suzann Pettersen (69) by a stroke. 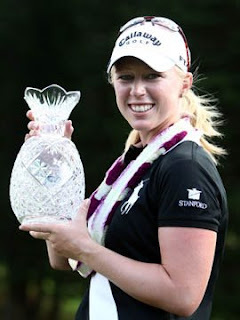 Pressel finished at 8-under 280 and earned $225,000 for her second career win. The 20-year-old Pressel birdied two of her final three holes and made a clutch 15-foot putt from the fringe near the front of the green to secure the victory. Both of Morgan’s victories have come at Pettersen’s expense. Unlike the 2007 Kraft Nabisco, Morgan wasn’t helped by last round collapses by her closest challengers. Randall Mell of the Sun-Sentinel wrote Sunday about the swing changes Morgan Pressel had been undergoing the last few months. The biggest flaw in Pressel’s game is her shortness off the tee. So far as I see it, Morgan is still below average in driving distance. The LPGA now leaves the US for its Asia swing. Leading off with its first ever event in China, followed by tournaments in South Korea and Japan. After that comes Lorena Ochoa’s invitational in Mexico and then the year ending tour championship. Only five weeks of pro golf for 2008 remain. I’d suggest you enjoy it while you can, but US golf fans have little chance of watching the Asia swing. Those tournaments are not broadcast on North American television.